Made of pongee material waterproof, Smooth and comfortable texture , easy to clean and dry. 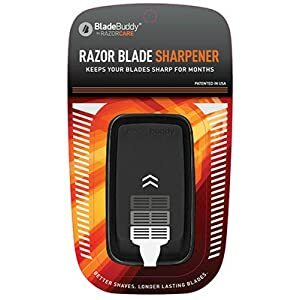 Handy design, keep your bathroom clean and tidy, make your shaving easy. Designed with a sleek self-packing pouch to easily stowed away or brought on the go when traveling. You can even use as a dopp bag for your shaving and grooming accessories. HIGH QUALITY – Made of polyester material, waterproof, velcro straps design for convenience use. Waterproof, washing machine safe, hang dry. 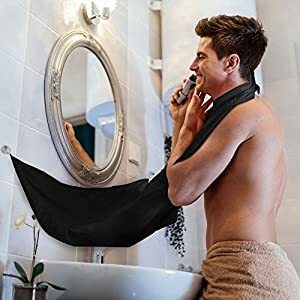 EASY TO USE – Attach the neck straps and secure to the mirror or somewhere smooth, easily catches your beard and hair trimmings shaving just like a salon cape to allow an easy disposal. 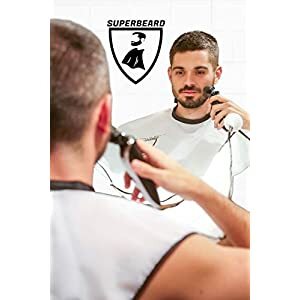 ONE SIZE FITS ALL – Larger and longer (49.5 X 33inch) than most other similar products, keep your bathroom sink clean when shaving with this Beard Catching Tool. 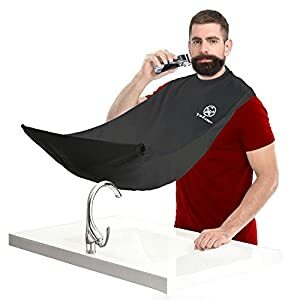 •	EVERY MAN MUST-HAVE: Never again worry about making your girlfriend angry or having to unclog your sink after shaving thanks to our new beard cape apron! It comes with suction cups that lock into place, making them ideal beard catchers bib for shaving mirrors. •	QUALITY MATERIALS: Made out of 100% nylon, our beard catcher for men is incredibly strong and exceptionally durable. Silicone hooks provide high grip with a mirror! 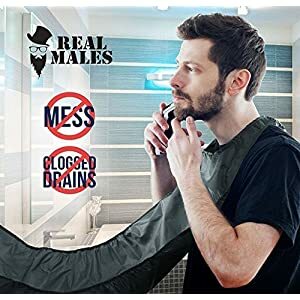 •	INCLUDES TRAVEL POUCH: Each beard Shaving bib includes its own travel pouch, allowing you to take it with you on business trips, getaways and family vacations in order to keep things tidy in the bathroom of your hotel room or rental. ✅ HIGH QUALITY- material made of Polyester pongee , incredibly strong and exceptionally durable that will last a lifetime. Easy to clean and dry. ✅ TIME SAVER- no more mess, no more clogging drains ,sink and everything around the bathroom. 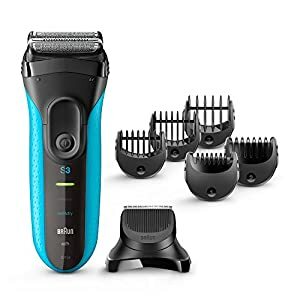 ✅ TRAVEL EASY- Includes TRAVEL POUCH, very light and easy to pack wherever you travel. 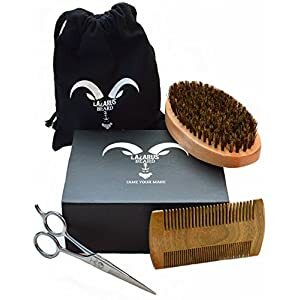 Beard Grooming Kit for Men – Lazarus Beard Co. – Beard Brush, Beard Comb, Mustache & Beard Trimming Scissors for Styling and Shaping Facial Hair – Beard Care Gift Set – Beard and Mustache Styling. BEARD KIT – Lazarus Beard Co. 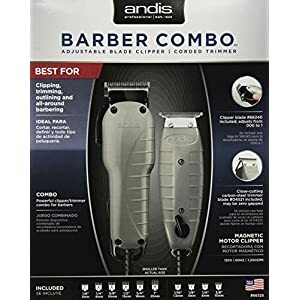 Premium Beard Grooming Kit, contains Boars Hair Brush, natural Sandalwood comb, and custom Stainless Steel Beard Trimming Scissors. 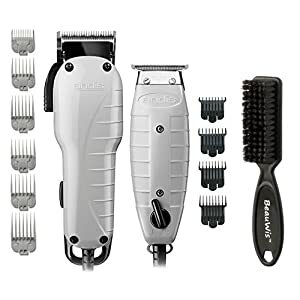 EASY BEARD STYLING – Styling, Shaping, and Grooming your beard has never been easier. 4 in 1 Beard Gift Box combines all your beard care necessities into one easy to use package. 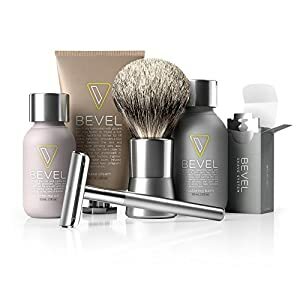 Our Beard Kit includes: Sharp 100% Steel Trimming Shears, Boar Bristle Beard Brush, and 100% All Natural Sandalwood comb with a bonus travel bag. BOARS HAIR – Boar bristle brushing is a natural conditioning and softening treatment for your beard! It helps with styling, but it was designed originally to improve shine and the texture of your hair before oils, and balms existed. Experience a consistently close and comfortable shave – each time you shave – day after day. Protect your skin from nicks, cuts, razor burn and ingrown hair. 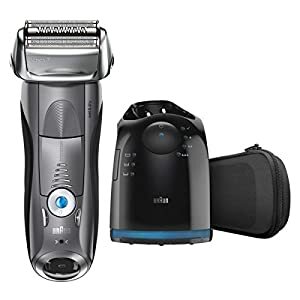 Clean shave: 3-pressure sensitive shaving elements for efficiency and skin comfort**Versus Braun Series 3. 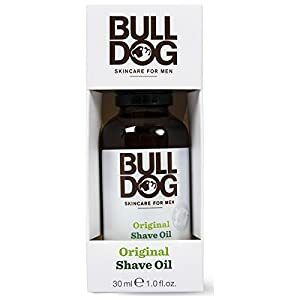 Tested on 3 day beard.